GridCast: live and behind the scenes of grid computing: CLCAR 2009 Started! 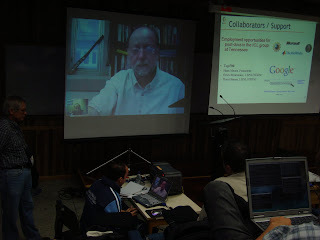 21 September, with Jack Dongarra's e-talk about "Current trends in Scientific Computing and Challenges for the Future", the CLCAR 2009 was started. 75 participants of different countries of America Latina are in the heart of the Venezuelan Andes to meet in the 2009 Latinamerican Conference of High Performance Computing (CLCAR 2009). Beside the "picos nevados" of Mérida City, in the Universidad de Los Andes site named "La Hechicera", students, researches and professors participate in several academic activities, such as tutorials, specialized talks and e-talks, panels and forums, marathon of parallel programming and technical sessions addressed to show regional and global advances and perspectives on HPC and Grid Computing. The CLCAR is not only a conference to treat specific and advanced topics, also, CLCAR allows scientific and academic integration. CLCAR is a space to meet, discuss and propose initiatives of regional development, an opportunity to know the cultural richness and the wonderful natural diversity of the American continent and to recognize our similarities.